How Can You Develop A Razor Sharp Instinct Of When and How to Take Your Interactions with Women To Higher Physical Intensity – And The Ability To EXECUTE So That She Desires More?? There has never been a book so well focused with effective and practical techniques that can be used immediately to excite a woman by using the body language, touch, and kinesthetic side of seduction. 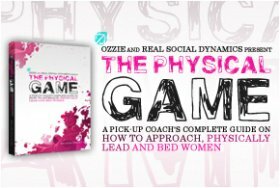 The Physical Game will enhance all of your skills, abilities, and techniques that will be a part in your success with all the women you encounter.